Nizhny Novgorod is, with the population of 1 271 045, the fifth largest city in Russia, ranking after Moscow, St. Petersburg, Novosibirsk, and Yekaterinburg. It is the economic and cultural center of the vast Volga-Vyatka economic region, and also the administrative center of Nizhny Novgorod Oblast and Volga Federal District. 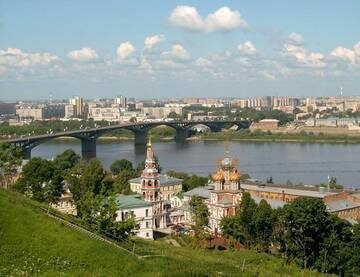 Nizhny Novgorod is divided by the Oka River into two distinct parts. The Upper City is located on the hilly eastern (right) bank of the Oka. The Lower City occupies the low (western) side of the Oka. From 1932 to 1990, the city was known as Gorky after the writer Maxim Gorky who was born there. Nizhny Novgorod is situated at a distance of 400km from Moscow. The climate in the region is continental, specifically humid continental and it is similar to the climate in Moscow, although colder in winter, which lasts from late November until late March with a permanent snow cover. The average annual temperature is +4,4 C°; wind speed is 3 metres per second; air humidity is 76 %. The sun shines 1775 hours during the year. Cloudiness in winter is rather high: 75-80% of time. And from April to August the probability of the clear sky is about 49-56%. The average precipitation is 653 mm a year, the most number of which is in July and the least is in March. Because of the great difference in relief there is the difference of temperatures in the upper and in the lower city. There are 6 universities, 4 academies, 1 conservatory and more than 5 institutes in Nizhny Novgorod. In general there are more than 50 institutes of higher education. Volga state academy of water transportation, R.Y. Alekseev Nizhny Novgorod State Technical University are the most famous institutes in the city. Copyright © Учебно-координационный центр "СПУТНИК"